This is a remarkable book about a remarkable subject, although it's not going to be for everyone. 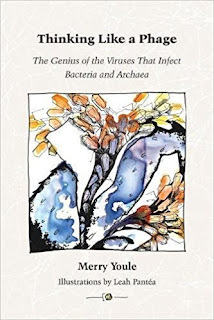 Merry Youle gives us chapter and verse on phages, the remarkably diverse range of viruses that specialise in making use of bacteria (and archaea) as their hosts. These incredibly prolific viruses range from the classic 'moon lander' structures to strange blobs and filaments. Some simply reproduce in a bacterium then destroy it, while others can keep their host alive indefinitely. But they are all worthy of our interest. Youle picks out around 20 variants who will star throughout the book. They are what she refers to as the 'pheatured phages', reflecting a slightly cringe-making tendency to go for fake 'ph' spellings on a regular basis. And should you read the book end to end you will find out a huge amount about them. You will also delight in the illustrations, which range from watercolour-enhanced diagrams to detailed sketches of complex virion structures to electron microscope scans and computer-drawn structural diagrams. There are lots of these illustrations, many of them in colour, making parts of the book a visual treat. We are simply bombarded, both in the text and in endless footnotes, with definitions for page after page. (And even those probably aren't enough, as some of the terms used that won't be familiar to the general reader aren't defined.) To be for the rest of us, the idea is as much as possible to avoid jargon, not to define it at length. There's simply far too much information we really don't want to know. Having said that, there are parts of the book that are still digestible to the non-biologist. For example, Yule gives her 'pheatured phages' nicknames like Lander, Fickle and Skinny' to avoid the awful names they tend to be given. But there's still plenty here that isn't accessible. It depends, then, what you are looking for. If you want an introduction to phages for biology students, this is truly wonderful, but for the general reader it's far too heavy going.